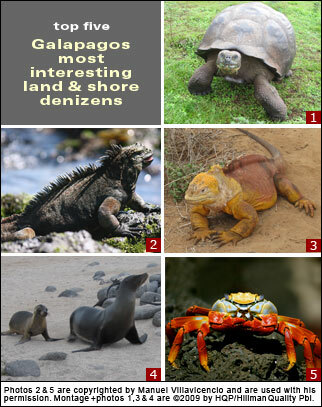 Criteria: Interest among sophisticated visitors to the Galapagos. Once, 250,000 existed in the Galapagos. Today, the population is down to 15,000, mainly due to 19th-century whalers harvesting them for food and liquid. The most famous giant tortoise was the century-and-a-half old Lonesome George, who livef comfortably at the Charles Darwin Research Center on Santa Cruz Island. The carapace (upper part of the shell) is unique on each Galapagos island, an evolutionary development. The giant tortoise is the largest land or sea turtle in the world. It weighs up to 250 kilograms (550 pounds). The giant tortoises' estimated lifespan is 150 years, some experts believe longer. Espanola, Isabela, Santa Cruz, San Cristobal, and Santiago. This Galapagos species is famous for its prehistoric monster-like appearance (see photo). Marine iguanas are the world's only bona fide sea-going lizard. These Galapagos creatures spend their leisure time onshore lazing together on dry, lava rock for warmth and protection (their soot-black skin camouflages them). Fernandina, Floreana, Isabela, North Seymour, and Santa Cruz. These sizable "dragon" lizards measure up to 3 meters long and some live over 60 years. The land iguana's normally yellow-orange to brown-color skin makes it a snap for first-timers to distinguish them from marine iguanas, their distant relative. Land iguanas prefer dry island areas. Diet is mainly vegetarian. Cactus fruit is a favorite food, for substance, nutrients and water.